Check clearing is the process of moving money to complete a payment made by check. The process can take several days, or it may be almost instant, depending on how the recipient handles the payment. Moving funds between banks: In most cases, the recipient (or payee) submits the check to their bank, and the bank collects funds from the check writer’s bank. That process often takes two to three business days, but it can take longer—especially for international payments and other unusual circumstances. Intermediaries like correspondent banks and the Federal Reserve often help with these transactions. Internal payments and check cashing: Funds sometimes move quickly. For example, if the check writer and the payee both use the same bank, internal transfers are faster. Likewise, if you cash a check at the check writer’s bank, the funds come out of that account immediately. If you received the check, you’re probably in a hurry for it to clear. If you wrote the check, you might be hoping for a few extra days to get money into your account. Logistically, the receiving bank or credit union (where the payee deposits or cashes the check) sends the check to the bank that the funds are drawn on, or to a clearinghouse. 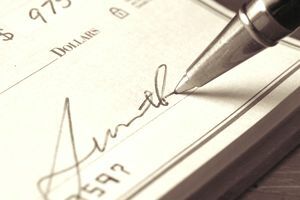 Banks originally sent physical checks to each other, but they increasingly use images of checks for improved efficiency. Assuming funds are available and there is no problem with the check, the paying bank transfers money to the receiving bank. How long does it take a check to clear after you write it? It depends on several factors. In most cases, checks hit your account two to three days after the payee receives your payment. Until the check clears, it is essentially just an IOU—a promise to pay, which you might not fulfill. But the clearing timeline is compressing since the Check 21 Act, which enables banks to handle a greater number of checks electronically, took effect in October 2004. Consider the money spent: When you write a check, act as if the money is no longer in your account. In the past, people did this by recording every transaction in check registers. Balancing your checking accounts (whether on paper or electronically) is still a good practice. Float time: You might be accustomed to waiting several days (or longer) to see money to actually leave your account. During that time, the check is called "outstanding," and you could potentially spend the money on something else. But you'd be spending that money twice, committing fraud, and setting yourself up for overdraft fees. Using the same funds twice while waiting for a check to clear is called "taking advantage of the float," and it can lead to numerous problems. How long do you have? It is technically illegal to write a check that you know can’t clear, so only write checks when you have funds available. In practice, you may actually have a few days. Processing times may depend on whether you mail the check or hand it to a cashier at a major retailer. Checkout registers often come equipped with check scanners that instantly convert your paper check into an electronic check—and you can be sure that the check will be sent to your bank as quickly as possible (perhaps even that same day). It depends on the payee: Even if you hand the check to an individual (such as a friend you're repaying or a plumber who works on your home), that person might use a mobile device to deposit the check. They might even take it to your bank and cash the check so that it clears instantly. Alternatively, the individual or business might let the check gather dust for a few weeks before taking it to the bank for deposit. Unfortunately, there's no way to know for sure. As a rule of thumb, assume that funds leave your account about two days after you pay by check, but that timeframe can easily change. If you receive a payment by check, you're probably antsy to use the money: You might need it for expenses, or you might have doubts about whether or not the check will bounce. So how long do you have to wait for the check to clear? “Available” does not mean cleared: When somebody writes you a check, it has "cleared" when the check writer’s bank transfers money to your bank and you can spend the funds. However, it's not always clear if or when the money arrives (or not). Your bank often allows you to spend money from deposited checks—and even withdraw cash—before a check clears. You're responsible for any checks you deposit, so you'll have to repay any funds you use if the check bounces after you've taken the money. Federal law (Regulation CC) requires that banks make at least part of your deposit available to you within a few days. For many items, like personal checks, the first $200 is available within one business day (if not immediately), and the remainder becomes available a few days later. Banks make larger amounts available for other items, such as government-issued checks, cashier's checks, and USPS money orders. Your bank can be more liberal than the law requires: The bank may simply assume that every check is good and allow you to withdraw the full amount immediately. Convenient, right? But if that check bounces, you’ve got trouble. The bank will debit your account to take the money back, and that can lead to serious problems. How long should you wait before assuming a check has cleared? It’s wise to be conservative about checks you're unsure of. With checks written from major banks, you'll often (but not always) find out within a few days if there's a problem. When checks come from overseas accounts, things can take much longer. Your best bet is to contact your bank and get a firm answer on the status of the check. Explain your concerns, and ask whether or not you're taking any risk if you spend the money. For more details, see How Long to Wait After Depositing a Check. For fastest service: To make funds available as quickly as possible, deposit checks as soon as possible. Use remote check deposit when available, and deposit checks early in the day to qualify for that day's cut-off time. Your bank often places a hold on deposits for five days or so, but in many cases, the funds become available more quickly. If that's not fast enough, try asking customer service or a manager if there's any way to free up some of those funds (this might work if you're an established customer with no history of bad checks in the account). If you have any doubt about a "cleared" check, don’t spend the money until you’re satisfied that your bank successfully collected the money it needs. Waiting is inconvenient, but dealing with a negative account balance isn't much fun either. Assuming that a check has cleared is dangerous. Sometimes an honest mistake causes problems, and sometimes con artists take advantage of misunderstandings about how checks clear. A common scam involves paying somebody with a check (especially a fake cashier's check or money order), but paying too much. Next, the con artist asks the victim to return the overpayment amount or forward the money to a “shipper.” The victim sends money that doesn’t exist, and eventually, the bank finds out the check was bad. Unfortunately, banks don’t protect consumers in this situation—the victim is responsible for any losses and will need to repay the bank.